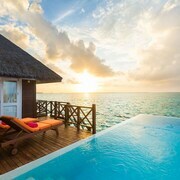 Wake up to the ocean at your door at this Embudhufushi resort, which is nestled on the beach. Regional attractions also include Kandima Beach. Situated in Velavaru, this beach resort is within 3 miles (5 km) of Meedhoo Harbour, Meedhuffushi Island Beach and Meedhuffushi Island Pier. Nestled on the beach, this Vommuli resort is 0.1 mi (0.1 km) from Vommuli Pier. Wake up to the ocean at your door at this Kedhigandu hotel, which offers direct access to the beach. Regional attractions also include Kandima Beach. 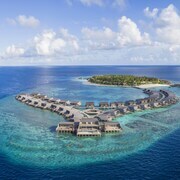 Nestled on the beach, this Dhoores hotel is 0.1 mi (0.1 km) from Vommuli Pier. 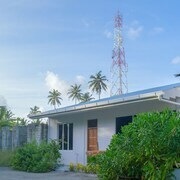 Nestled on the beach, this Maagau Island condominium resort is 0.3 mi (0.5 km) from Vommuli Pier. 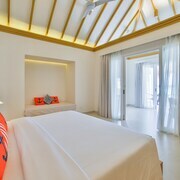 Situated near the beach in Hulhudheli, this guesthouse is in the same area as Vommuli Pier. Friendly staffs and beautiful location, will certainly visit again!